Want $800 cash? Then why not join this fabulous Hello Spring $800 Cash Giveaway. The cash prize is a great way to help you start something you always wanted to do or get something you always wanted to have. Simply follow instruction in the rafflecopter here. I said it several times already. It's hard to be a working mom, not just physically but much difficult, emotionally. After what had happened to my son last week, I really wanted to just stay at home and take care of him. Since the accident, my son became extra malambing with me. For the whole week I am with him, it was like he only sees mommy and when I’m out of his sight he will scream “Mommy!”. I can’t even go to comfort room or take a bath without making him sleep first. He doesn’t want anyone but mommy. 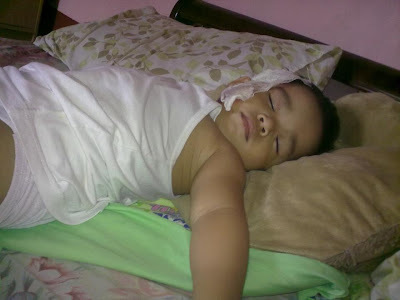 I thought he was just sick then but even now when we arrive from work, no one can touch him except mommy. What is really good about him is that he doesn’t make habol when we are about to go to work. I think he actually understand that we need to go to work but we will be back later. As soon as he sees mommy home from work, he will stick to me no matter what. We are blessed to have a son that is adorable, lovable and bright. I must admit that one of my frustration as a working mom is my lack of time to teach him. 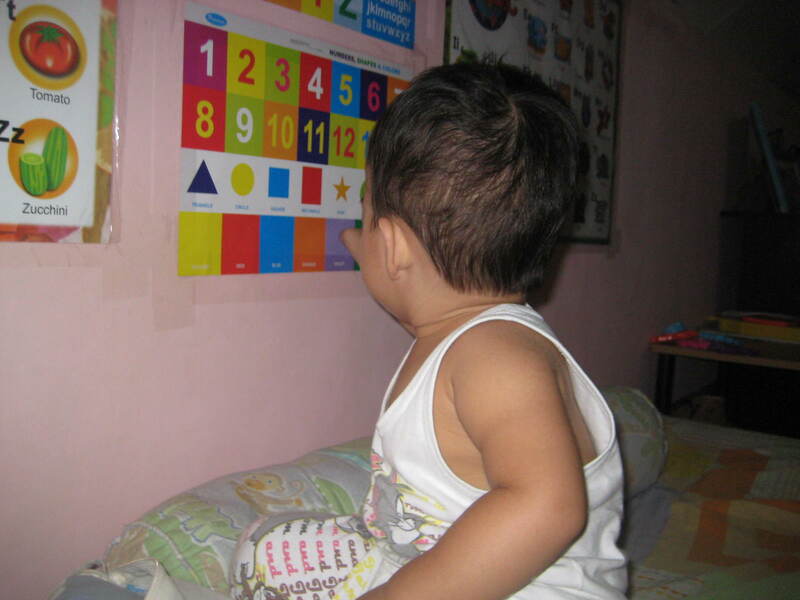 But mind you, he is learning on his own from the learning video he is watching every day and from the educational toys we bought for him. 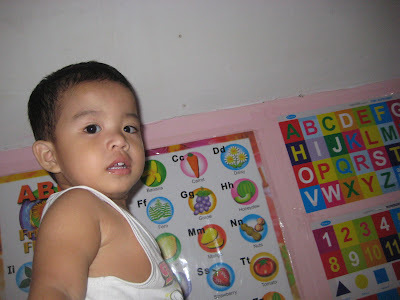 I have yet to take video of him reciting the alphabet and the numbers because when he sees me holding the camera he will make it agaw. We are happy when we are watching him watching his learning videos. Why? Kasi naman inuunahan pa nya un video nya. So bright, right? One proud mommy here, lol! 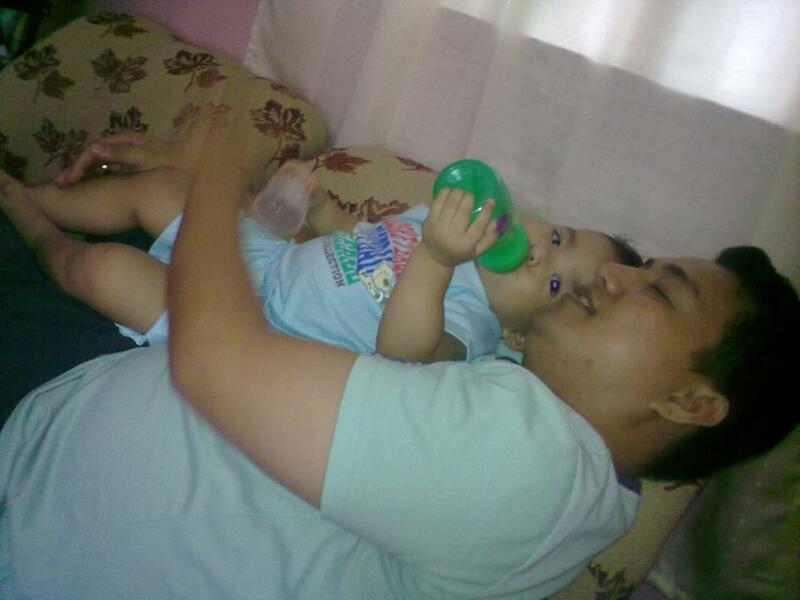 March 19, 2012 should have been a happy day for us since it was Daddy Allan’s birthday. Unfortunately, it turned out to be an unforgettable nightmare for my family. My son was rushed to the hospital due to burn from hot water. Upon hearing it, I froze and I stumbled. I immediately shutdown my PC, grabbed my things and my phone. I called my husband and told him about it and asked him to drive back our work place as soon as possible. As soon as he arrived, we went straight to the hospital. It was my longest travel ever. I was very emotional and in tears. I called our phone at home and someone answered telling me that my son was rushed to the hospital due to burns on his face and chest. The blood went up to my head, I was cold and my heart really aches. I love my son so much that I don’t allow any ant or mosquito bites him. I don’t even allow him to play outside for fear that he might fall and have wounds. So why is this horrible thing happen to my son? You could just imagine how I keep on praying and crying at the same time. I asked my husband to drive fast so we could reach the hospital. Immediately after our car was park, I jumped and run to the Emergency Room. There I saw my helpless son crying so loud. It melts my heart to see him in that way. He looked at me calling “Mommy!”, I breakdown and cry. My husband hugged me tight and said that everything will be okay. Fortunately, the wounds are not deep and look like blisters but the burnt skin should be removed to avoid infections and darkening. 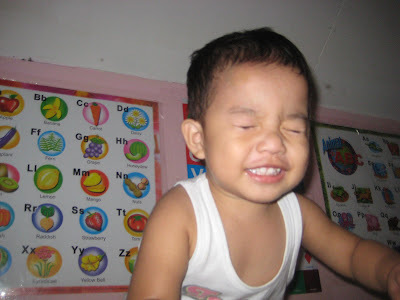 Somehow, I was relieved when his eyes are alright and the doctor told us to not panic because it was not that serious. I held his hands and kissed him saying “baby it’s gonna be okay”. After it was cleaned and dressed, my son fell asleep. He was tired I know and I held him tight. We brought him home and as per the doctor, he was safe to take home and don’t need to be confined. At home, I called my boss that I will file an indefinite leave because I want to take care of my son until he is fine, and he said yes I can take my leave. I know his healing will be faster when I am beside him all throughout. How does he got the burns? 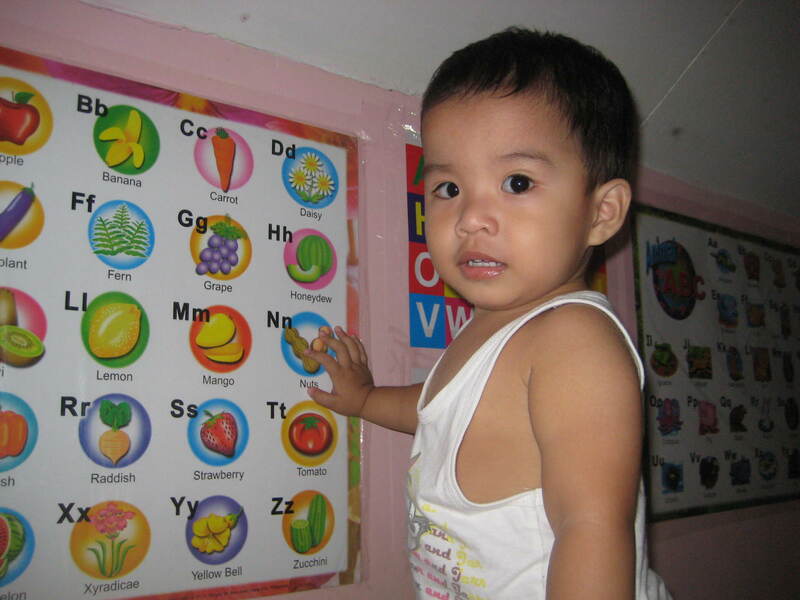 His lola told him that he will take a bath and as a bright toddler who knows the preparation, he helped his lola get the thermos. Unfortunately, the pout of the thermos was open and Daddy forgot to close it. See, some simple things are really important. My son is a bright and independent boy. He observes everything around him and will do things by himself. 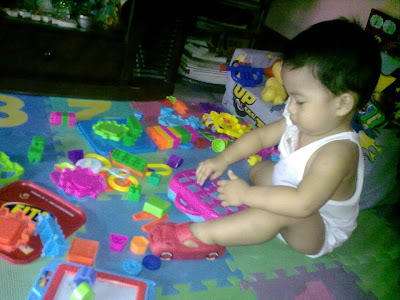 He will clean up his toys after playing and put it back to where it came from. And most of all, he is a very helpful little man. Here is my son after the accident. The wounds need to be dressed to avoid infections. Wounds are still fresh but that doesn't bring down his high spirit. Children are really source of happiness and peace. Back to his daily normal life. 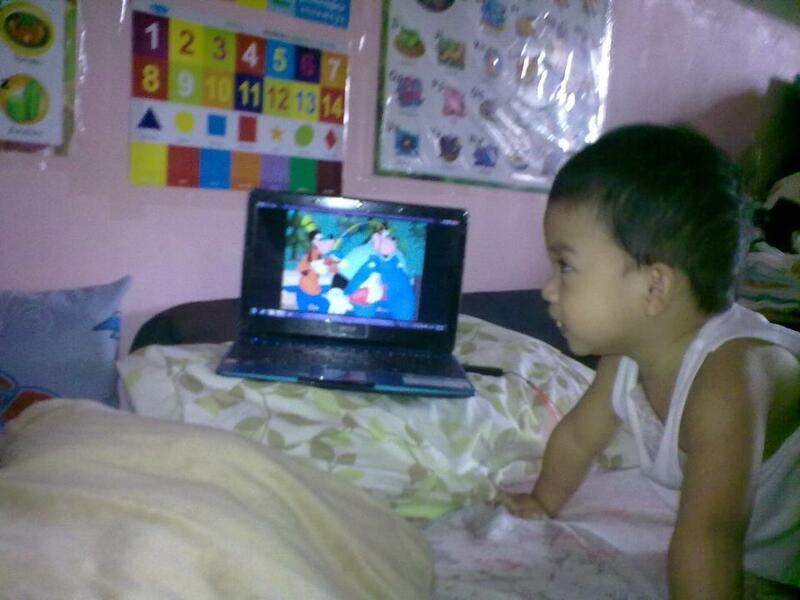 Watching Mickey Mouse Clubhouse, his favorite! He is really doing well. wounds all dried up fast. 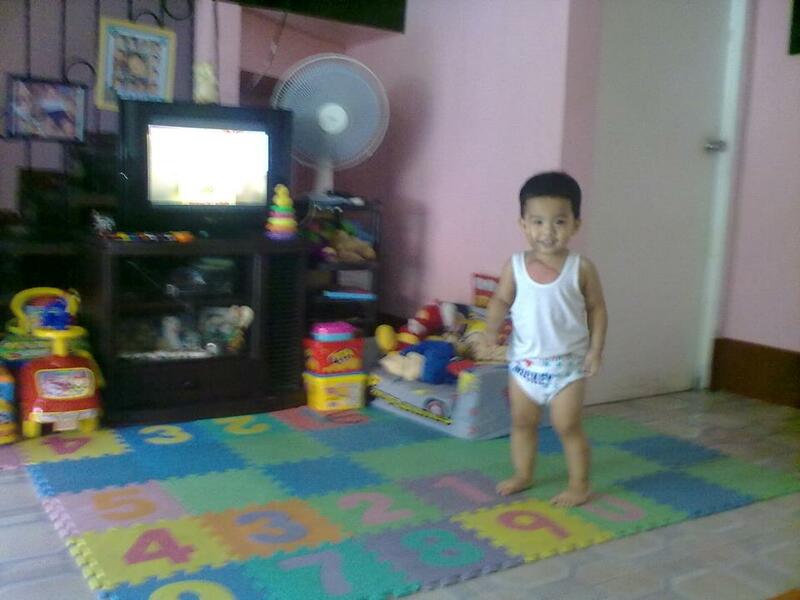 His appetite does not change, he is super matakaw. His wounds dried so fast and he had flat pinkish marks on his right face and chest. We patiently apply pure Vitamin E oil and Virgin Coconut Oil, after hot bath or compress of grean tea+guava leaves+serpentina leaves, to remove the scar and I'm glad its effective. I am still waiting fro the almond oil that my Kumare will send me. They say, like VCO, it will reduce the scar's redness but it is lighter to skin. By the way, he had phobia with that thermos and he will look around first to look for that. 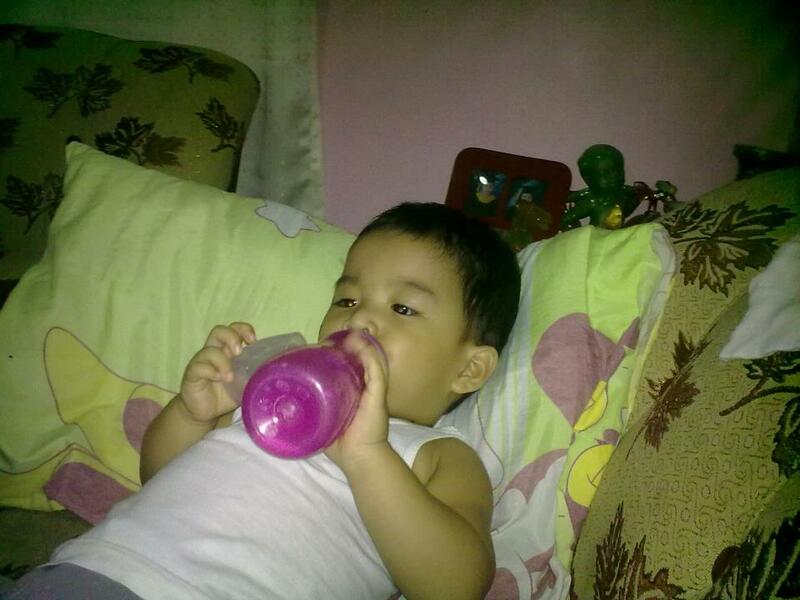 When he see the thermos, he will say "babagsakan ka nyan! ", as in in straight sentence. Its really amazing how this little man can make us smile and how he can cause us to stumble. I know it happens for a reason and God will not give us this test without learning. 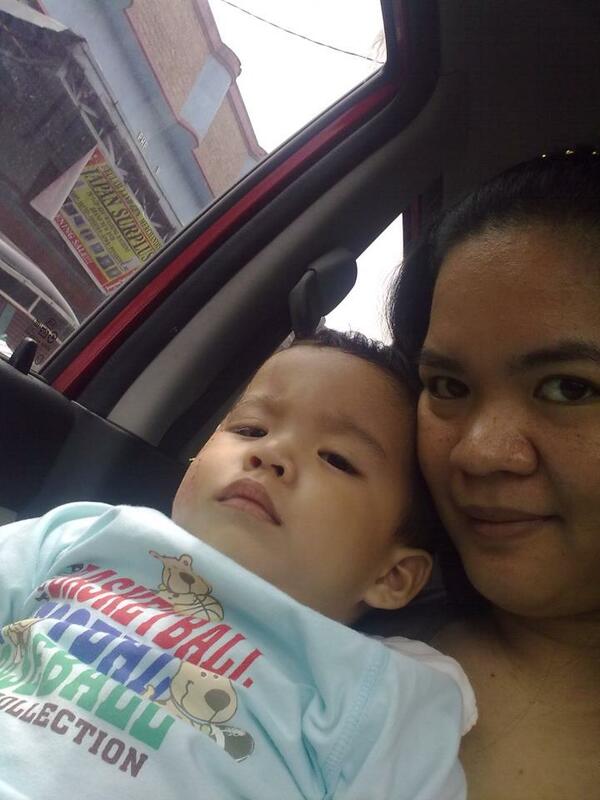 We went out last Sunday to drop his lola in Pulilan then drive thru his favorite bee, Jollibee. We can not go to crowded place yet since he is not totally healed. I am really thankful that the accident did not create a serious injury on my son and does not damage his eyes. I know that accidents really happen so we are taking super extra precautions to prevent it from happening again. God is really good he save my son from much injuries. That's it, I am emotional up to now. I hope this will never happen again. UPDATES - PRICE INCREASE: To sweeten the prize, CouponTrade.com will be doubling our pot! If you would like to update your posts to reflect the new $200 prize and sponsorship we would of course LOVE it! Wow here is a FREE Blogger Event! Bloggers, this is your chance to have your Facebook link added for FREE, and The ULTIMATE Baby Shower will provide the $100 Paypal Cash! That's easy right. So join now! Here is another Cash Giveaway from Contest Chest. Just fill in the rafflecopter and get a chance to win $500 cash. Don't forget to paste the URL of this page on the first entry. Go and Good luck! Having a place to go – is a home. Having someone to love – is a family. Having both – is a blessing. ~ Donna Hedges. My family is so precious to me and having them is my biggest blessing. I became selfless since I have them. 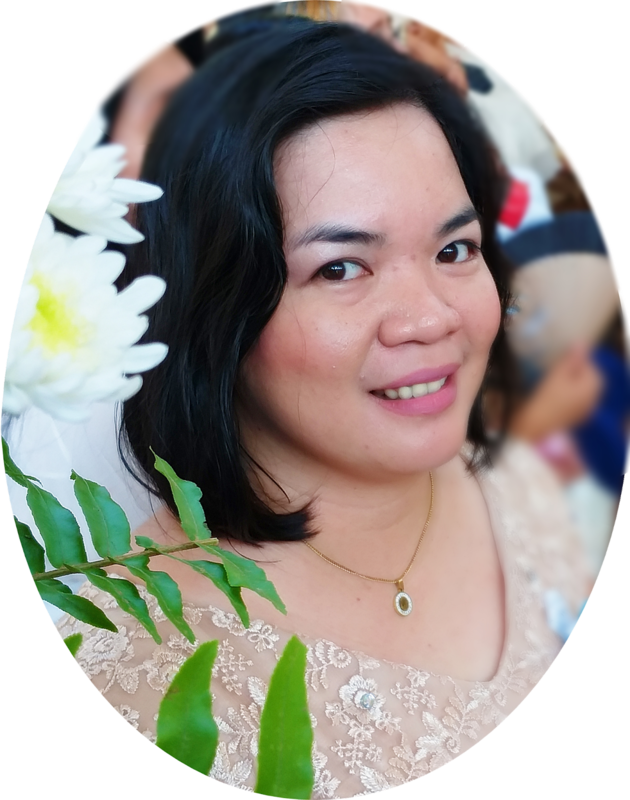 I am a working mom who is also a full-time wife and a 24/7 mom, without overtime pay and no rest day. But all of these sacrifices are worth it especially when you see your family safe, healthy and happy. I have been an avid follower of MomCenter Philippines FB Page and if I have time, I really join their fan page photo contests. And this time it is the Cutest Family Photo Contest. 2. Include your full name, child's full name, and *country. 2. Remember, only one (1) entry per fan is allowed. So it’s best to decide your best photo. 4. There will only be one (1) winner every month. 5. LIKES AND SHARES SHOULD BE DONE ON THE CONTEST ALBUM SPECIFIED. MC will be the one to update the album. 6. Previous winners are encouraged to join after three (3) months to give chance to other moms who would like to join. 7. The winner will win a special prize from our sponsors. 9. Photos submitted beyond 4pm, Monday to Friday will be uploaded the next day. 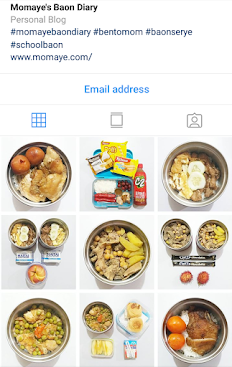 Please like our photo here. Like also MomCenter FB Page. You are probably thinking why you need to create your own website and buy your own domain when you can have a free blog/website. Well, as I have mentioned before free website can be deleted anytime. Free website does not have its own domain name (i.e. www.momayes.com), and if you want to have a domain name you’ll have to pay for it for more than you should. Companies offering free website may take advantage over your blog by posting ads all over it and removing theses ads will require you to pay money for a premium package, which includes most of the really good features. So if your intention is to really earn money from blogging or website then go and buy your own domain for your website to have its own web address. Having your own domain name means your web address is yours and you’ll have an assurance of not losing your months, or even years of hard work. To create a website, there are four easy steps you can follow. Register a domain name. A domain name will represent the URL of your website (i.e. www.momayes.com). You need to be careful in registering a domain name because the readers create their first impression about your website from your domain name. Make your domain name appropriate to the subject of your website, simple and catchy, concise and with the right extension (.com, .org or .net). Acquire a web host account and connect with your domain. You will need a web host or hosting provider to make your website accessible for the world to see. They are the company with equipment and technical capabilities to make your website 24hours/7days available to the world. Be careful in choosing hosting provider. As much as possible, avoid those that offers low pricing if you want your website to run smoothly and with minimal period of down times. Search and select an established web host. After choosing the best web host, you need to connect your domain and your web host account. Go back to your domain provider and follow instructions in connecting your domain with your web host provider. Build and customized your website. After connecting your domain name and web host, you need to create and build your website. The easiest way is to use the free website builders from your host provider. You may also prefer to build your website by yourself but you need to learn about html. You may buy website template or download a free website editors. Through website editor you can preview how your site will look once it is built, and it provides all the important and detailed procedures you can do in customizing your website. You can upload photos from your PC’s hard disk, make your own personalized header, and change the color theme and even the blockings of your website to satisfy your taste. Upload useful content and posts. The contents should be helpful, concise and relevant to encourage your webpage visitors to read the entire post. You should make your posts or contents interesting so that visitors will come back and be your regular readers. Publish and promote your website. Once you have finished customizing and adding contents or posts then publish your website. There are free ways to promote your blog. You can visit different blogs or websites you are interested with, and leave a comment with the link to your website. You can also visit different forums and place your website URL in your profile name. If you have social media accounts like Face book and Twitter, then you can also use them to promote your website or blog. Now that you already have your own website with your own domain, then you are ready to make money from it. Keep in mind that it is not an overnight success. Be patient, work hard, be creative and up to date, and always be a learner. As I have said before, we can actually earn money online. Many are earning money online more than what they used to earn from their regular job. I create my blog for personal use only. But then through blog hopping, I have learned that I can make money online through blogging. To start a blog, it is very important to define your blog’s Niche or subject. Choose a subject that people are interested in and you know a lot about. Decide for your blog’s name. Make it simple, catchy and easy to spell. After creating a blog, you need to blog on a daily routine. Connect with different bloggers, build network and fill up your blog rolls through link exchange. This will help you promote your blog and build rank to get more traffic. Then, how to make money through blogging? Advertising. This is the most common way your blog can earn money. You can either put a CPC or CPM Ad Networks in your post and side bars. Google Adsense is a CPC Ad that pays on a click basis. Google Adsense program basically allows you to select ads related with the content of your blog and pays you based on how many readers click on the ads. On the other hand, CPM Ad pays by the total number of impressions. You can use ContextWeb, Adify, Adbrite and the likes. You can also sell ad space directly to advertisers. Sell Other’s Product. Another way is through affiliate program. This enables your blog to be a sales agent. Your blog will serve as the medium between the readers and online sites like Amazon.com. By displaying their products, readers can click directly from your blog to Amazon to get more information about the product. If the reader buy and pay for that product, you get paid as well. Accept Product Review. Mommy bloggers like me often accept products for review. Either you get paid for making a review or you get some good products. Many companies are reaching out with bloggers, especially mommy bloggers because most readers value what they are saying. In this case, always be careful in accepting product reviews. You need to really try and use the product for your own credibility. Publish Paid Articles. You can also publish paid articles in your blog. There are blogging communities like BC Bloggers that you can join. They will help you connect with other bloggers and link with your blog. Link exchange will help you to build rank and to get more traffic for your blog. Advertisers are usually more interested with blog’s of higher page rank. Online Selling. You can actually use your blog to sell your own products. Although some online seller still use other social networks to promote their blog. Join Blog Giveaways. Since you develop network blog connections, you can join different blog giveaways. Actually, most blogs are giving away cash usually through Paypal, to promote their blogs. Joining is just easy and sometimes they require you to have a Facebook, Google+ and Twitter accounts to complete tasks. I am a working mom and I really aim to have a home based work so I could stay at home. The possibility of making money through blogging is really great. But again, it cannot be done overnight. You need patience, knowledge and continuous exploration of the different possibilities and ways to earn money online. Last year, I have come across Mommy Diary site and I have noticed this BC Bloggers badge. To my curiosity I click the link and the rest is history. I never knew that I can earn money through blogging because my main intention in creating my blog is for personal reasons only. I just want a diary where I can put my thoughts, my motherhood and parenting experiences. 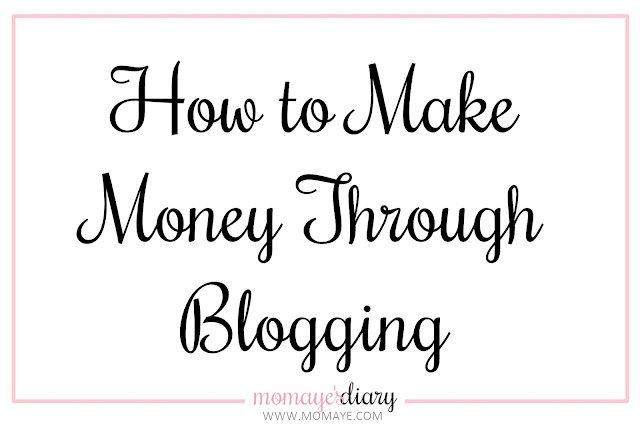 Through blog hopping, I have learned so much about those mommies working online and earning money. Since then, I have longed to be a stay-at-home mom, work online and take care of my son. I am still hoping because being a working mom is not really easy. BC Bloggers is a community that helps bloggers to connect with other bloggers. Through this you can easily connect with different bloggers, build network and fill up your blog roll fast. The good news is that BC Bloggers has expanded from link building with our fellow bloggers to link building with advertisers. Link exchange is a way to promote your blog to able to build rank and to get more traffic for your blog. The higher your blog’s rank, the more appealing it is to advertisers. As they always say, you do not have to beg for links in BC Bloggers. It is really helpful, especially to bloggers like me who wish to earn money online too. 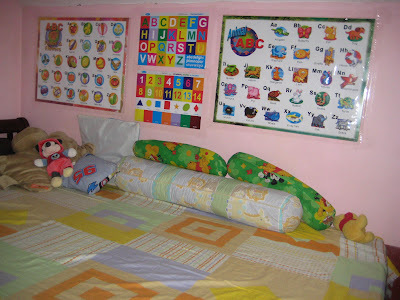 Hopefully, I will be able to make my wish come true through the help of BC Bloggers. To know more about BC Bloggers, click here. They say that our mothers are our first teacher. And now being a mother that is one of my duties, to teach my son not only to read and write but to be a good and loving individual. So we bought ABC posters at National Bookstore. 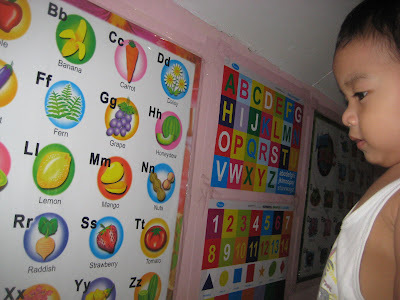 We chose animals and fruits/flowers ABC, ABCs, Numbers, Shapes and Colors. 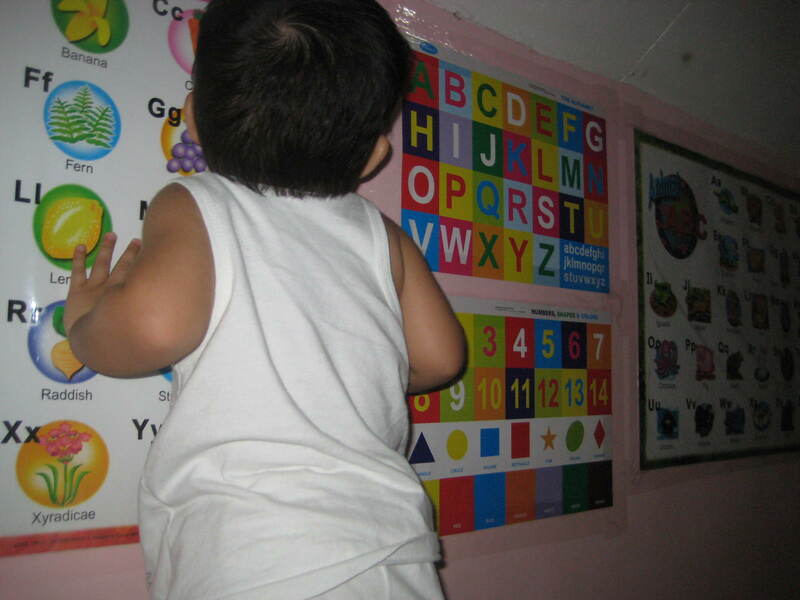 Excited much, we post it in our bedroom wall so that every night before we go to sleep I can teach him. As a working mom, the only time I can teach my son is before bedtime and during weekends. 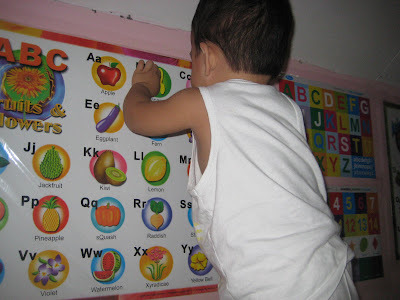 I am not pushing my son to learn them all at once but I am encouraging him to love to learn so I will not have a hard time teaching him later. 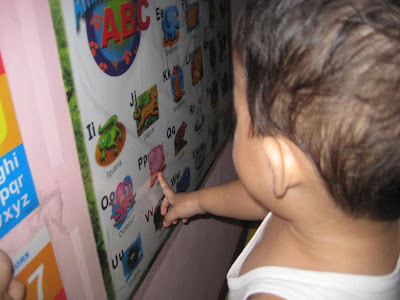 I teach my son to be Bilingual for effective communication. To learn about it read this: "A is for Apple, B is for Bola": Teaching Kids to be Bilingual from Smart Parenting website. eto nakakatawa, eat daw nya un grapes. See, even for 30 minutes every night I can teach my son all he needs to learn. Imagine if I am a stay at home mom already, I bet he already knows all the animals, fruits, shapes and colors. He can even recite ABC and 123 by now. 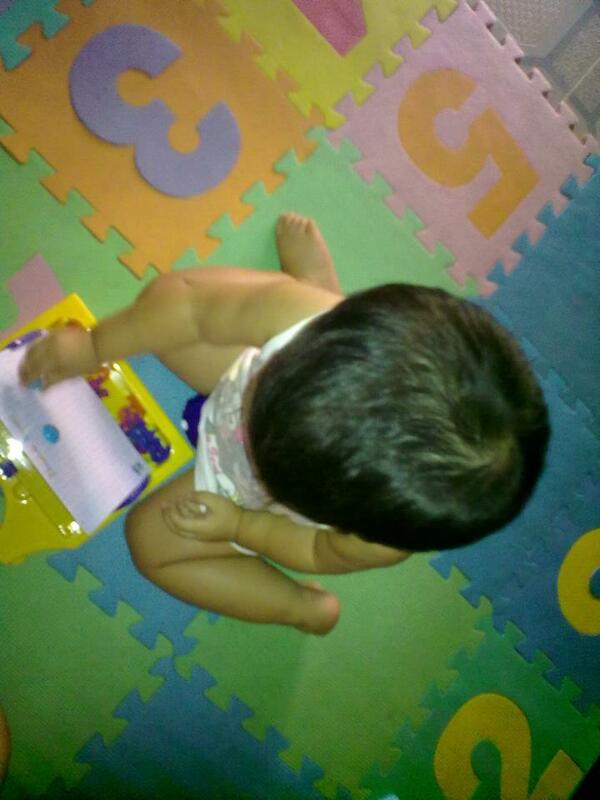 He is still young though, but this is the age when he can easily absorb and learn so many things. That is why we are really careful on what we are saying because he imitates whatever he hears. 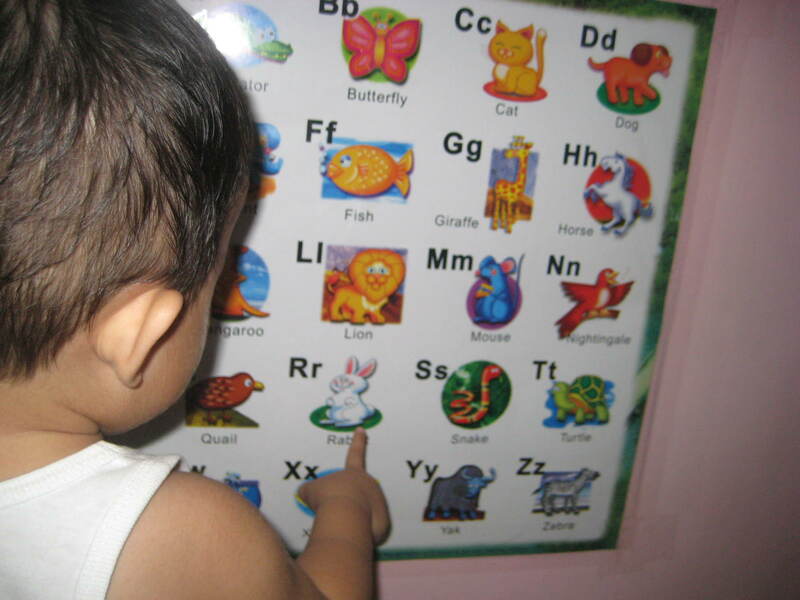 How about you moms, how do you teach your child? 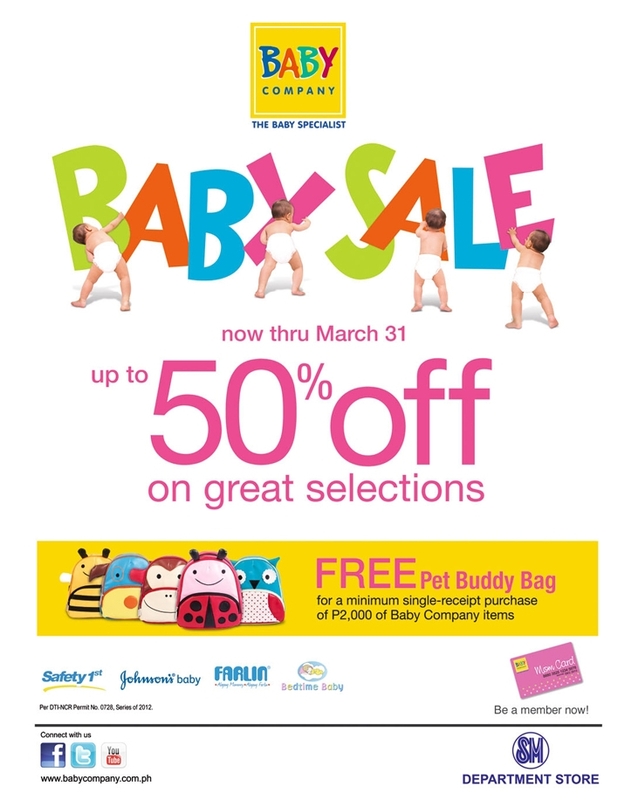 Mommies, the Baby Company's month long Baby Sale is here! This is happening from March 1-31 so hurry! 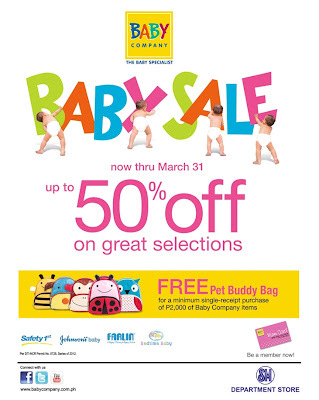 Moms can enjoy buying for their babies for clothes and accessories for 50% off on great selections! Also, free pet buddy bags are given to moms who can present a minimum of 2,000 single-receipt purchase of Baby Company items! Like Baby Company on facebook for more details, and don't forget to visit MomCenter Philippines for different parenting tips. Being a working mom is very difficult and I need to manage my time for my work and my family. Especially that I have a son, I really want to stay at home and just look after him. In my search for online home-based job I have discovered several ways on how to make money online. Blogging. Since I am a mommy blogger, this is what I have learned first. You can actually start with a free blog. You need to find a decent free blog flat form like Blogger.com and then define your niche or your main interest, and start posting. Choosing a blog’s subject is very important since you need to consider your viewers interests. Make your blogging a daily routine to invite readers and create more traffic. Then you can accept paid advertisement and product reviews. That's how to make money through blogging. Freelance Writing. If you have a passion for writing or think you are good at it then you can apply as a freelance writer. There are sites like oDesk (now UpWork) that offers many writing jobs both full time and part time. It depends on what you prefer for. You can also earn money by selling your articles. You can join sites that will give you topics to write for and then ask you to submit it within a period of time. Paid-to-Click Ads and Surveys. You can also earn extra money by joining paid-to-click sites. They will ask you to click ads with an equivalent amount. Also you can earn money through taking surveys and then the site will pay you either through cash or through points convertible to cash or gift checks. Joining Blog Giveaways. If you are a blog hopper then you can earn money through this. Many bloggers are organizing giveaways like cash ($) usually thru paypal, giftcards and different products from their reviews or sponsors. You must have a valid email address, and most of the times they will require you to have a Facebook, a Google+ or a Twitter account for the tasks. Joining is easy and no purchase is required. Just follow the instructions to fill in a form or the easy rafflecopter button. Online Selling. You can actually sell even with no cash capital. How? You can start by selling your personal things that you are not using. In case of a mom like me, you can sell your baby’s pre-loved clothes, shoes and toys. You just need a camera to shoot a photo of the items for sale then post them at buy and sell websites. You can also sell using your Facebook page. The money that you will earn from it can be used as your capital to buy more stuff that you can sell. But always be careful not to be swindled by a bogus buyer. Note: Having a Paypal or Alertpay account is very important because most of the payments are through this. There are lots of ways to earn money online and you can even earn money through discussions. But always be careful not to be scammed. As much as possible avoid sites that require you to pay for membership. You can actually earn more money online at home than working full time outside home. What really excites me is the fact that I can command my own time and be with my son 24/7. But it is not that easy as everyone thinks. You need to study how, establish yourself especially if you are from other field like me, have patience and always be trustful. Celebrate St. Patrick’s Day with Mommy Bloggers – PayPal Cash Giveaway! After completing the above tasks, kindly fill-in the Rafflecopter HERE. This giveaway is open worldwide. Your blog should be at least 3 months old. So hurry and grab the chance to win some cash!